Coming from a peasant family, from childhood he had a strong craving for art, but his parents did not share his interests, and being still quite young, Orlov left home and went on to study for a wandering painter. They went to the villages, offered their services in the painting of houses, temples..
His skills and techniques were improved; later he began to receive orders for icons and portraits from rich landowners. Fate brought him once with a noble nobleman, who, seeing the work of young Orlov, found it necessary to send the young man to Petersburg, to the Academy of Arts! There he became a brilliant student of Briullov, and as an encouragement he soon got the opportunity to go to study painting in Italy! He painted canvases inspired by Italian life, festivals, holidays. He was so fascinated by the Italian beauties, completely immersed in the genre of historical painting, that until his death he never returned to Russia. During his lifetime he received numerous praises from both the Russian and Italian public. 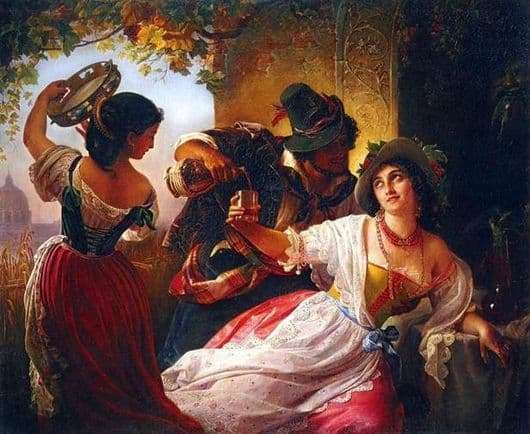 The painting “October holiday in Italy” is the best, most famous painting by Orlov, performed in the best traditions of romanticism, in which the influence of his teacher, Karl Bryullov, is visible. The softness and beauty of color, smoothness of contours, lightness, an amazing play of light. October in Italy is the month of the harvest, people celebrate, have fun and rejoice and honor Dionysus. People drink wine, dance, have fun, the evening air is gentle and warm, the outlines of Rome are visible, bunches of grapes fall down from above, a woman dances and beats a tambourine, a couple drinks wine, looking tenderly at each other. In the picture there is lightness, carelessness, grace – in every pose, every movement, every fold on the dress.